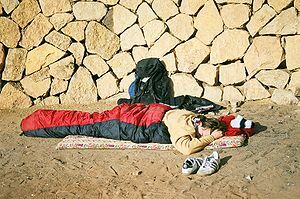 I’m always apprehensive about washing my sleeping bag; I’m afraid I’ll ruin it. There are few pieces of hiking gear as important to me as my bag, and I do everything I can to get a comfortable sleep in the wilds. 1) Read the label, or get advice on the company’s website. 2) Close all zippers and fasteners, then turn the bag inside out. 3) Use the right soap. For “down” bags try Nikwax Down Wash or ReviveX Down Cleaner; for “synthetics,” try Granger’s Extreme Cleaner Plus. 4) Wash it. Hand wash in a tub, or use a front-load washing machine, not a top-loader which can tear baffles. Always choose a gentle cycle, and do an extra rinse to remove all soap. 5) Remove carefully. Hang it lengthwise on a laundry line until most of the water weight is gone. 6) Dry it. Place bag in a large commercial dryer, keep it on LOW heat, and check frequently. Remove down bags every 30 minutes to de-clump the feathers. Back home, leave the bag unstuffed for a few days. Always use a gentle non-detergent soap. Put washer on gentle cycle using cool water. Use a tub with warm water for down bags. Do a cold-water rinse and let the remaining water drain from the bag. Exposed drying in natural air is best, but it will take a long time. So far, I’ve been successful. My bags are clean. This entry was tagged backpacking, camping, hiking, long-distance hiking, sleeping bags, thru-hiking. Bookmark the permalink. Ray, this from the metafilter link: “…the tennis balls in the dryer trick to fluff them back up”. I use a tennis shoe, adding it to the dryer for the last 10 minutes. Wow! Haven’t heard of that before. I’ll try it. Thanks, Journey. Did we finish Katahdin together in 2003?